Even though it’s been very tight at times, the Springboks are starting to win games they would have lost in 2017, and winning builds momentum and confidence. Last year we played more of an expansive game that gave ball to the wings and there was less kicking, and I think that’s changed because there’s more clarity on the kicking game under Rassie Erasmus. As you’ve probably picked up on this November tour, we’re very much a team that relies on three things to put teams under pressure: our kicking game, massive defence and a big pack of forwards. The one change that I think would make us a much better team is if we were more balanced in our kicking game. What I mean by that is the scrumhalf is making 80 percent of our kicks, and we need to spread that responsibility out across flyhalf, fullback and the other backline positions. Aside from the kicking ratio, the quality of our kicking off 9 is an area of concern for me. Faf de Klerk is inconsistent there and it’s no better with Ivan van Zyl or Embrose Papier. In five kicks, we’ll win one back, one will be on target, one will be too short and two will be too far. If we’re going to ask the 9 to make so many of our kicks, there’s a massive responsibility to make sure the ball is going where we want it to. If you look at what happens when the Scotland, England or Ireland scrumhalf kicks, that ball comes down exactly where they want it to, and I think that’s where the Boks are behind. We have one of the best packs in the game and we have a world-class flyhalf, but if you play against the Boks you know that somewhere in the match you will receive at least one counter-attack opportunity in the form of an inaccurate kick. When you play against Conor Murray and Ben Youngs, you know every ball is going to be pinpoint. The Boks will go to the next level if we reduce the 9’s role in the kicking game to roughly 20% of the kicks, and kick more off 10 (40%) and the outside backs (40%). Then we’ll have the ability to match Ireland and New Zealand because both those teams have a massive kicking game that uses a variety of kickers. Handre Pollard is obviously a good kicker, Damian de Allende and Jesse Kriel can both kick and we don’t use Willie le Roux nearly enough in the attacking kicking game. If we can change so that we play a phase or two more before we kick, bringing the defending wingers up and isolating the fullback, we’ll be a lot less predictable. 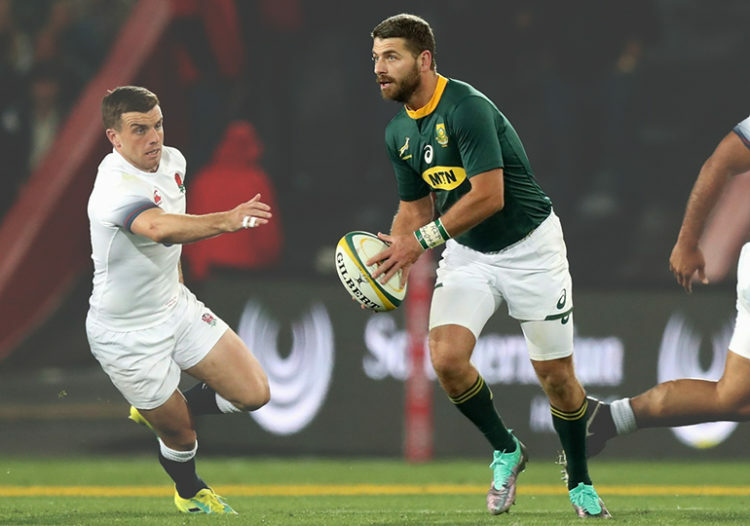 The Boks need to play to create scenarios where opponents have to cover a left- and right-footed kicker, and all we have to do is practice those scenarios to equip the decision-makers to identify where the space is. That’s what Scotland did against us – they used cross-kicks to push our wingers deep and wide so they could attack more. And then when we came up, they looked to kick in behind us. Willie is a very clever player and Wasps often put him in position to make those kinds of decisions – launching attacking kicks when the wingers come up or playing wide when they’re deep. The Boks used him like that against Argentina at Kings Park and he really put the Pumas under pressure. The good thing about the Boks is that we know how we want to play, and we know what needs to be fixed. Rassie is very smart and he’ll identify the execution of kicks off 9 as something that needs to improve. We have a handful of Tests before the World Cup and the head coach will have to decide whether he’s going to try and fix all three scrumhalves and give them each a run, or only focus on his first- and second-choice. Ideally, there should be a Bok kicking coach working with the guys during Super Rugby next year, but it seems that Rassie is going to be involved with the Bulls and hopefully he’ll have a plan to get Ivan and Embrose up to speed. Thanks Vlok, valid points. Yes our kicking game needs improvement and better variety. interesting dilemmas for the boks. Depending what they want to place more emphasis on. One aspect where the boks had a clear advantage was the proactive aggressive defense of Faf. But Faf is not a natural kicker out of hand, the road to upskill him in that regard could be to long for the WC. Lambie & Elton are definitely the best kickers out of hand, but Pollards overall play and game management is better. In spight of his many spacial awareness shortcomings deallende is vital to quick go forward ball, and out of the available specialist 12’s he probably has the best kicking game. Not sure if Steyn an Serfontein will ever be in contention again. I don’t like this style of playing. It’s too one-dimensional. What use are two brilliant wings if we don’t give them the ball? To just chase and tackle? I think we should switch things up and keep the opposition guessing. Play off 9 and 10, while sometimes bringing in the 15. These play-makers then decide to either kick the ball for territory or in the gaps, or to distribute it further. Our centres should be able to switch it up between taking the ball up or distributing the ball further. That is where our biggest problem lies. Our go-to centres don’t have what it takes between the ears to make these decisions. De Allende and Kriel only knows how to run into people. The reason why I like Esterhuizen more than De Allende is because he can take it up, but also distribute when necessary as he did with the Sharks in the recent seasons. He’s a much better defender as well. A player like that needs more coaching to hone his skills in decision making. Players like Harold Vorster, Lukhanyo Am and Ruhan Nel are ideal as well. They can create space and utilize it. Why are the Boks better when Jantjies is playing 10 and Pollard is playing 12? Because Pollard can actually make these decisions. Imagine having Pollard at 10 and a 12 that can also make decisions? Then you can have players running off the 10 or 12’s shoulders and break the defensive line. Get rid of Kriel and De Allende. Use the full backline. Playing 10-man rugby is k@k.
Agreed Chris, a little more balance in what we are doing at the moment is what is needed. Games in Europe are, through necessity, a little tighter, but there are still opportunities to go wide, which we seem to have forgotten about! There is still a perception that tries get scored from set pieces and all the side really has to do is get the ball wide to the wings and bobs your uncle! Tries come from broken play, turn overs, mistakes, mauls etc Defensive systems have change the role centers play. As far as I can see it is about creating mismatches and that means constantly taking taking the ball up over the gain line and sucking opposition players in. The AB’s have scored 1 try thus far on this NH tour! Are their centers useless? After every game we have pundits picking out the centers as the cause of all our woes. What Vlok is eluding to is our kicking is generally poor and if we kick the ball in the right places we will be more effective. I also like the Jantjies / Pollard combination. John, I have my doubts about SBW, to be honest. He’s way short of his best. The All Blacks were looking much more dangerous when ALB came on. During the last 20min of that game it was all All Blacks and the Irish had to defend for their lives. The main attacking kickers for them are the 9, 10 and 15. I honestly prefer Perenara over Smith at the moment, as he picks up the pace of the game, which allows the backline to dictate the play a bit better. Compare that with our box kicks, Faf takes 5 seconds to set up the perfect box kick and still screws it up. This gives the opposition time to reposition and then attack as we just gave the ball away. I agree that the NH scrummies are good with the box kicks as they can put them close to the sidelines. But the SH teams should play their game and to their strengths. We shouldn’t force our players into a style of play they’re not familiar with. You don’t pick a fish if you want to fly. The players get chosen for a reason, so let them play the way that got them chosen in the first place. A good coach should recognize that. Rewriting the annals of rugby theory it would seem – first phase front foot ball no longer important – interesting! Breaking defensive lines is no more difficult now than it was 30 years ago. Defensive structures have certainly evolved, but so have attacking structures, or at least for some players, whilst others seem a little one dimensional! It is true to say that one keeps it a little tighter in Europe, but when bashing it up is the only thing on offer, you’r in trouble. As with most things in life, balance is the key and thus adding more variety to our attack is what is missing! Our centers have returned stats of “one pass in 80 minutes of rugby” in every test on tour thus far. If that’s not one dimensional, then I’m sure what is? The law makers rewrote the annals of rugby. So much so the the team with less possession and territory, typically, are winning the game. Lekker gelees Vlok. Jy ken jou rugby. Agree Vlok 2 many useless kicks. Our 9’s will have 2 work on their kicking game. I suspect that the shift that we have seen from electrifying attack by our wings to a more Direct style with loads of emphasis on kicking, has come about through the coaching staff trying to adapt our game to European conditions. The problem is that this style does not overly suit some players, like Faf, whilst others have overly embraced it to the extent that their performances can only be seen as “Stampkar”! This was brought home by watching the Sale Shark game this past Saturday. Faf was back to his best which indicates that perhaps we have adapted a little too much and have forgotten that you can still go wide in Europe, when the opportunity presents! Geez just when I thought we had identified our biggest weakness as our kicking game at the expense of keeping ball in hand and CREATING chances, along comes Vlokkie and suggests we kick even more with everybody getting a chance to hoof it up. I’m glad to see some serial dom krag supporters on this forum have changed their tune to some extent by speaking of the need to be more creative with ball in hand. I’ve been saying it for years now and it’s still happening in 2018. The Japanese were every bit as competitive against England as we were especially in the first hour by keeping ball in hand and attacking with skill, vision and creativity. We are nowhere near to that level. Remember the last time we played Japan beat us, lol. Pollard is not creative enough imo just workmanlike in a predictable safety first game plan. The centres are plodders and Vlokkie suggests they kick even more ? What a load of. Therein lies our weakness and apart from Willie there is not a creative brain cell among the backs, starved wings excluded. Same team on Saturday ? Probably but let’s see if Einsteins theory will apply once more. Cheers. Off topic here I know but what has happened to the Rassie’s 50/50 black representation come the WC in ten months time with only four tests to go ? It’s common knowledge that there will be no changes for the Wales test so Rassie will have reached only 32 % and only three games in the RC next year to address this serious shortfall. Remember also quite a few of that 32% have been making cameo appearances at best so they are hardly test match battle hardened. I can already see the EFF, Cosatu and the ANC sharpening their knives in eager anticipation of him cocking up. A rod for his back ? Good luck Rassie I hope you know what you are dealing with here. Next year is election year remember so the Malema’s of the world are going to up the ante no end. Cheers. Ja, he’s got some serious head scratching to do there. Does he suddenly drop the players who have been winning games for him in order to reach the target? Although Beast and Am will most definitely come into the 23. Does that mean Notshe and Nyakane leapfrog other deserving players in the name of transformation. Glad I’m not the coach.